Max Pankau is the arranger of 50 Hymns for Brass Quintet. 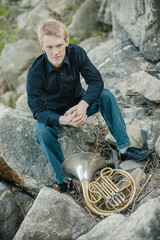 Max earned his Bachelor’s degree in horn performance and his Master’s in Composition – both from DePaul University. Max’s compositions have been performed throughout the United States by many ensembles, including Fifth House Ensemble. 50 Hymns is for any quintet wishing to broaden their repertoire and increase marketability, and is a perfect addition to any sacred music library. It is engaging and challenging for players of all levels, as well as being custom designed for the brass quintet. Visit brassgigbook.com for more information.